When there's a new, highly anticipated car just hitting the market, it's not unheard of for used examples to be selling for more money than new ones that you might wait months for. But few people actually take the bait from speculators who got up high on that wait list to make a quick couple of bucks. 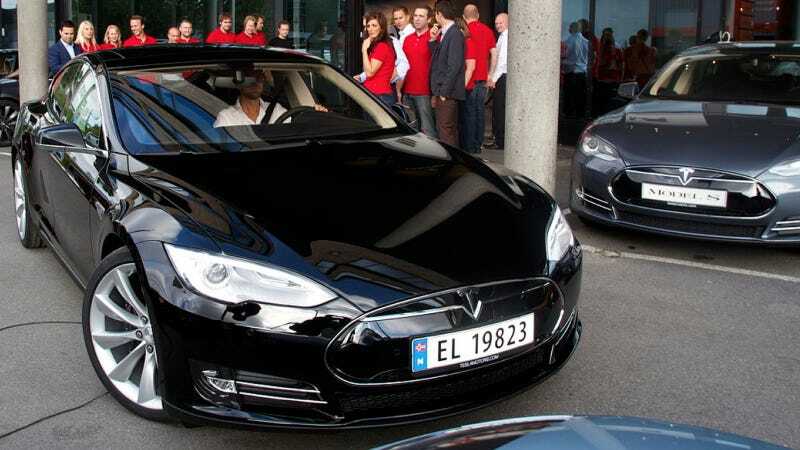 Except in Norway, where everyone seems to want a Tesla Model S.
Reuters reported yesterday that the demand for the Model S is huge. It was already the best-selling car in that relatively minuscule car market, beating the Volkswagen Golf's 561 sales with 616 cars. Naturally, there are buyers who spent a lot to get the Tesla's electric performance and wow factor in their garage before their friends. That includes a 27-year-old finance guy who Reuters interviewed who paid a premium buying one used instead of new. The Model S costs the equivalent of $110-117,000 in Norway, and some are being listed for around the equivalent of $130,000. That's not really the case in the U.S. After some digging on eBay and Craigslist, most Model Ss I found were selling for totally reasonable prices. Sure, a couple people are trying to get people by charging more for a slightly famous car, but most are selling for less than new ones. Guess our demand for Teslas is being met just fine.